George Graham Reviews Little Feat's "Chinese Work Songs"
Back in the 1960s, in our youth-obsessed hubris, we used to have an expression, "Never trust anybody over thirty." That slogan might also have some resonance today among "Generation Y," but Baby Boomers now find themselves in a situation where it was thirty years ago when they said that. Things that arose in those days have been steadily marking their thirtieth anniversaries, including some of the famous rock bands of the period. There are of course, the Rolling Stones, and also groups like Yes, the Moody Blues, Fairport Convention, The Band and Santana. Another group noting their thirtieth anniversary as a functioning organization is Little Feat, who have just released their sixteenth album called Chinese Work Songs. Founded in 1970 by the late Lowell George, with Bill Payne, Richie Hayward and Roy Estrada of Frank Zappa's band at the time, the group at first served as a vehicle for the distinctive songs of George, including such classics as Willin' which were covered by others. But with time, as the personnel settled into the key members who are still with the group, Little Feat -- which was, by the way, named after Lowell George's foot size -- became known for their good time music with a combination of great rhythmic grooves, with occasional jazzy forays, thanks to keyboard man Payne. Lowell George passed away in 1979, but the group continued on with the same trademark style: a bluesy, vaguely Southern rock sound, strongly danceable but often with unexpected syncopations, alternating with an almost Steely-Dan like musical sophistication. After a 1981 compilation album, the group took a recess, but re-emerged in 1988 with fine release called Let It Roll, that sounded as if they had never gone away. Little Feat have been at it more or less constantly ever since, with a surprisingly durable personnel lineup, with essentially the same members for the last 12 years, with the exception of the departure of Craig Fuller, the former member of Pure Prairie League who joined the band at the time of its reformation. The lineup on the new CD includes co-founders Payne on keyboards, and Hayward on drums, along with quarter century members Paul Barrere on guitar and his instantly recognizable vocals, percussionist Sam Clayton, and bassist Kenny Gradney. Members since the 1980s include guitarist Fred Tackett, and vocalist/percussionist Shaun Murphy, who has been adding her backing vocals to the group since they re-convened in 1988, and by their 1995 Ain't Had Enough Fun album had become a full participant doing some of the lead vocals and contributing to the songwriting. One of Little Feat's distinctions has always been the quality of musicianship the individual members brought. Most, especially Payne, Tackett and Hayward, have had busy careers as studio musicians, appearing on classic albums going back to the 1960s. But Little Feat remains a great live band, and they spend much of their time on the road. 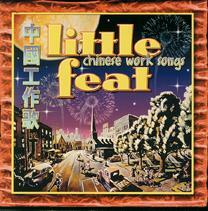 Chinese Work Songs continues the Little Feat's spirited grooves, though the album was recorded and assembled digitally by computer rather than on conventional tape. The high-tech process did not seem to detract from their music, which has always managed to tread the fine line between musical perfection and a live feel. This generous CD has a good helping of both, with bluesy tunes, funky grooves and jazzy instrumental flights within their songs. Interestingly, four of the CD's eleven tracks are cover tunes from rather diverse sources: Bob Dylan, Robbie Robertson of the Band, Phish, and the 1980s pop band The Hooters. But the group's own material is strong, perhaps more instrumentally than lyrically, and is just the sort of thing that will keep the group's fans happy. It really marks this as one of their better recordings. With all the bad pop, and especially alternative rock bands appearing, having one hit and deservedly fading away, it's nice that Little Feat have remained a durable institution -- this year marking their thirtieth anniversary as a band, and showing no signs of diminishing in musical quality. The group's combination of rhythmic grooves, bluesy Southern Rock sensibility and jazzy musical sophistication makes for a one-of-a-kind sound that has been keeping their diverse group of fans happy for a long time. The group's musicianship has always been top notch, and their new 16th album Chinese Work Songs shows them in as good a form as ever. They don't really break any new stylistic ground on this record, basically coming up with pieces that highlight the group's strengths, but they do what they do so well, that it's impossible to complain. Though I doubt that many of the new original compositions will become classics like some of their past material, in terms of quality of performance this is definitely one of their better releases. The sonic quality of the CD is generally good. The computer hard-disk method of recording allows very sophisticated editing, but that did not detract noticeably from the live feel of the performances. However, the mixing and mastering put everything at the same steady volume, and that makes the CD sound loud but flat, lacking impact and not very open. The use of audio compression is not necessarily a bad thing for a rock album, but the squashed sound of this CD tends to bury the subtleties of the group's fine musicianship. Still, it's better many current pop albums. Perhaps with the growning interest in jam bands among younger fans, Little Feat may see a revival in their own popularity among a new generation. In any case, it's nice to know that a band over thirty years old can be trusted, and have definitely not gone "over the hill."